Cutoff pentodes (6SJ7 or 6SD7) are used to drive 6L6 or 5881 output tubes. Tungsram 6SJ7 and Sovtek 5881WXT tubes are shown in the photo. The power supply is solid state and DC is used on the tube heaters. The OPT covers are made from copper clad board and the enclosure is all aluminum and hand made. 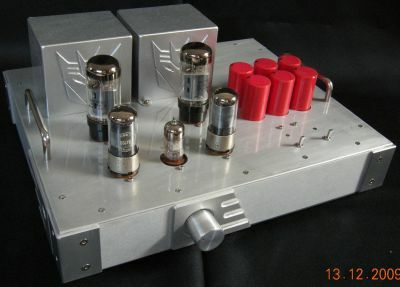 See the DIY Single-Ended (SE) 6L6 / 5881 Tube Amplifier project page for more information.